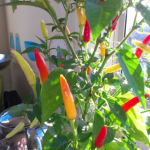 Chillies are a personal favourite of mine. 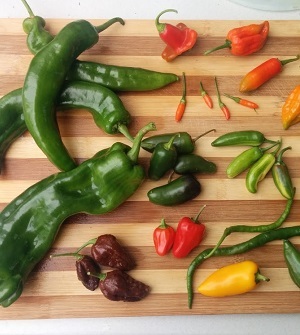 With the differences in cultivars among the five domesticated species of Capsicum, there's shapes, colours, flavours and heat-levels to suit anyone! 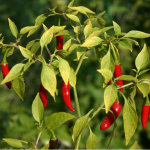 Great in food, good for you, and easy to grow, chillies make a rewarding herb/spice to keep in your garden. HOT Long and thin. 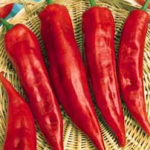 12cm Cayenne is a chilli cultivar that is as much prized for its health benefits, as it is for its use in various cuisine. Matures from green to bright red. 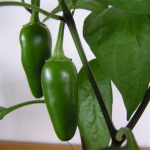 Capsicum annuum With a mild to medium pungency, and good sized fruit, Jalapeño chillies are a firm favourite with many. 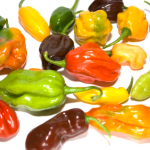 They can be eaten fresh, pickled, smoked (known as chipotles), or stuffed (poppers). Matures from green to bright red. Usually used when green. HOT Small thin pods with pointed tips. 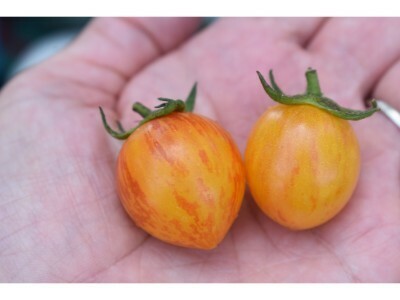 4cm The small fruit ripen from green (through yellow and orange) to bright red. 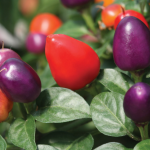 Capsicum annuum Loco is a compact multi-branching bush type chilli with many pungent short and small upright bright purple fruits that ripen to red. Attractive patio plant. Flowers are also purple or purple tinged rather than white. 10 000 - 24 000 SHU MILD > HOT Small and round. 2cm Matures from almost black through purple to red. 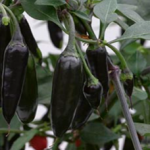 Chenzo Capsicum frutescens Attractive black fruit, and a compact growth habit makes this chilli a good patio or balcony specimen. Fruit are of medium to hot pungency and tasty. 45 000 SHU HOT Tapered pods measure about 7cm Brilliant black maturing to purple, then green and finally red. 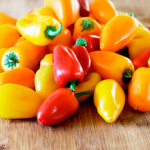 Capsicum annuum These very mild sweet peppers are also known as wax peppers, and are typically eaten when bright yellow. Not to be confused with Hungarian wax peppers (hotter) or Pepperoncini. 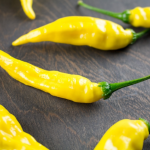 Aji (yellow) Capsicum baccatum Ripening from green to a bright yellow colour, with a fruity taste and hot pungency, the yellow aji pepper is perfect for hot sauces. MILD 5cm Elongated conic shape. Bright green or yellow-green. Capsicum baccatum The Bishop’s Crown or Christmas Bell Pepper is a hot pepper with unusual shaped fruit resembling a joker’s hat. 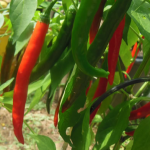 Ripening from green to bright red, they are easy to grow and prolific. MILD > HOT Bell/crown-shaped. 6cm Green to bright red. 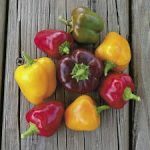 Capsicum annuum On a par with a very mild Jalapeño in terms of heat, these sweet-with-a-bite hybrid peppers are perfect for stuffing, pickling, or roasting. Small and round like little red cherries. 5 000 MILD Small and round. Bright red. 7-Pot Capsicum chinense Related to the Trinidad Scorpion Pepper (2nd hottest on record), the 7-pot peppers are extremely hot. 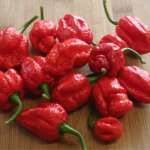 The name implies one chilli has enough spice to make 7 pots of hot chilli stew. Fruity. 950 000 - 1 000 000 SHU EXCEPTIONALLY HOT Round, plump and wrinkled (dimply), sometimes with a "sting-like" pointed end. Bright red. flavour and a searing heat. Delicious in hot sauces, especially if paired with fruit. Mostly used in sauces, salsa, marinades and other processed liquids. 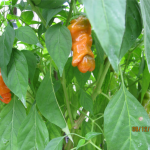 Capsicum frutescens Bushy plants with upright growing fruit maturing from green through orange to bright red. Native to the Tabasco province in Mexico, these juicy chillies are for hot sauces and vinegars. 30 000 - 50 000 SHU HOT 4cm long tapering pods Ripening from green through yellow and orange to red. 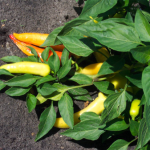 Capsicum frutescens This compact & bushy chilli is family of Tabasco peppers and has masses of upward-facing fruit ripening from green through pale yellow, orange to bright red— like little flames. 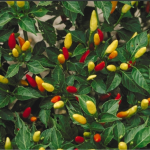 50 000 - 80 000 SHU HOT 4cm long tapering pods Ripening from green through yellow and orange to red. 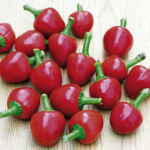 Capsicum annuum Jingle Bells are sweet mini bell-peppers with fruit resembling Christmas light bulbs. 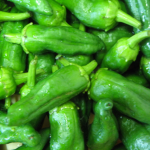 Delicious fresh in salads, stuffed with feta cheese, or pickled. 0 SHU SWEET Small round, bell pepper shaped Green, red, orange and yellow. Capsicum annuum This heirloom is grown for its very unique shape! Quite piquant, it is mostly pickled. Definitely one that will be talked about if you grow it! 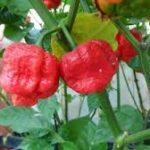 Capsicum annuum Producing large, oblong and tapered fruit, like a cow or bull’s horn, the Corno di Torro Pepper is sweet and delicious. Eat fresh or charred under the grill. May be mildly spicy. Capsicum chinense This habanero is fragrant and very hot. 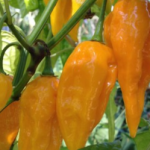 Resembling somewhat a flying saucer, they are great to use in hot sauces. VERY HOT Oblong and Lantern shaped. Deep yellow to bright orange. Manzano peppers, and are charecterized by their black seeds and hairy leaves. Very hot. SWEET Various Green, red, orange, yellow, purple. 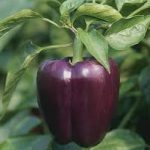 Tequila Capsicum annuum Large purple bell peppers ripen to red if left on the plant. Gorgeous coloured fruit makes this a sought after hybrid. 0 SHU SWEET Bell pepper Purple to red. 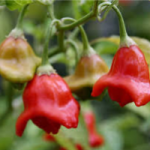 A list of the capsicums - hot chilli and sweet peppers - we will be growing at MeadowSweet this season (2016).